Living the life in the capital of class. 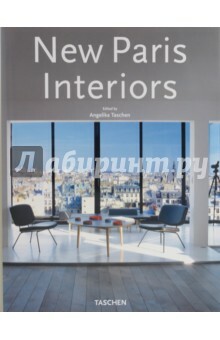 Fourteen years after the first volume in the highly acclaimed Interiors series comes the first of our all-new updated titles: New Paris Interiors. The city of light is a place of persistent beauty, from the Tuileries gardens to the banks of the Seine to the heights of Montmartre. But the restrained palette of beige and stone painted by the city&apos;s noble architecture may leave one wondering if Parisians are color-impaired. Fear not-for New Paris Interiors, Angelika Taschen has brought together a selection of apartments so astonishing, so surprising, and so inspiring that you very well might not know what hit you. Think texture, think dynamic space, think eclectic, think vivid colors-these interiors are packed floor to ceiling with new ideas, unexpected pleasures, and prime examples of 21st century living. Architect India Mahdavi, French Vogue editor Carine Roitfeld, auctioneer Simon de Pury, shoemaker Christian Louboutin, gallerists Philippe Jousse and Didier and Clemence Krzentowski, fashion designer Rick Owens, and many more of the city&apos;s most interesting personalities have opened their doors for this breathtaking collection of resplendent Parisian homes. About the editor: Angelika Taschen studied art history and German literature in Heidelberg, gaining her doctorate in 1986. Working for TASCHEN since 1987, she has published numerous titles on art, architecture, photography, design, travel, and lifestyle. Texts by: Ian Phillips is editor-at-large for the German edition of Architectural Digest, and a regular contributor to Interior Design and the American edition of Elle Decor. Издание на английском, немецком и французском языках.